Oriss are able to create large quantities of promotional mugs for your campaigns to help raise brand awareness using ceramic mugs or porcelain mugs. Please feel free to share your printed promotional mugs project details with us and we will get back to you with options as quickly as possible. Logo Mugs are ideal for helping to ensure your brand message or event experience stays in the minds of the recipients for as long as possible. An ideal way to help make the most of your promotional and marketing budget. For the most cost effective approach to producing customised promotional mugs, we recommend minimising your colours in the design to help your budget stretch further . Very detailed full colour graphics can be printed to a large area around the mug meaning there are no limitations with regards to your artwork specifications for print. If your promotional printed mugs are to be given as gifts for a special occasion, window gift boxes can be added to conceal the mug whilst revealing your brand message through the window. 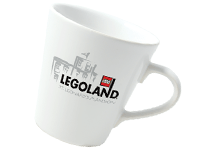 Branded mugs can be produced using Earthenware mugs in different shapes and two tone colour schemes for the inside and outside of the mug. A selection of bone china mugs available including Balmoral Bone China and Marlborough Bone China which tend to be the most popular options for personalised mug requests. Let's Get Started With Your Promotional Mugs Enquiry Today ! Please let us know what you have in mind for your custom printed mugs request by clicking the button below and we will get back to you as quickly as possible.